We love play dough in this house – I used to think that it took too long to make it so brought it and then hated when it mixed – so for a while I was a “mean mummy” and only put out 1 colour tub at a time. But I have changed. I discovered the ultimate play dough recipe on The Imagination Tree and have used it ever since. It’s so easy to use that we’ve been experimenting with it and using it in fun situations. Last week you will have seen some of our batch of Chocolate play dough being used as Rocks in the Small World Oceans Play it was great the colour was perfect for play. 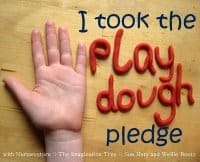 Today we’re taking the play dough pledge and playing with play dough all week. Today’s play dough is a mixed up mashed up bits that we’ve been playing with on and off since the 30 days of hands on play and T’s play dough play. It’s now thoroughly brown and has multiple smells/scents that have been added – it’s grainy from when we took it outside and we used sand as pizza toppings! So when J was painting and asked for play dough I had no problems. He took the lead and turned the play dough into a canvas for his latest art project. I will say now that play dough and paint do not mix very well on paint brushes and it’s lucky that we buy our paint brushes in bulk as with the painting I couldn’t save the brush that J used and it’s now become a play garden brush but it was great to see him take the lead. Whilst he was painting his play dough canvas (yes it was still soft) it was great to talk about the marks that he made in the dough with the brush. When he asked for pipe cleaners from our collage box I quickly got them out and he added them to his art work talking the whole time about what he was doing. When we paint on playdough we use rollers. It works great, and the rollers can be washed and used again! Oooh, we’ve never painted the play dough before we baked it. We’ll have to try this. Oh, I love this Cerys! Very creative and fun! What a wonderful explorative experiment. I bet he had so much fun and got so much out of this session. Wonderful indeed! Child heaven! Playdough AND paint!